If you are considering generating your own sustainable energy, you may wish to consider installing a hydroelectric energy system, providing you are lucky enough to have access to running water on your own land. Hydropower harnesses natural water flows, found in rivers and streams and uses them to power a turbine, which in turn generates electricity that can either be channelled to a battery, or the national grid. The British Hydropower Association (BHA) are a trade association committed to promoting the benefits of hydropower as a sustainable energy resource. As with solar and wind power, you may be able to get help from your local authority and/or your energy supplier with the costs of installing a hydro-electric system on your land. Hydroelectric energy is potentially the most cost effective form of sustainable energy for the home. 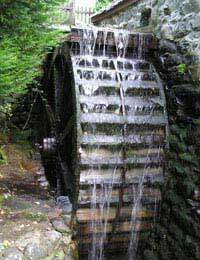 If you are fortunate enough to have even a small flowing stream on your land, you could potentially generate enough energy to power your home all year around and be left with an excess that could be sold to the national grid. Hydro energy is the most consistent form of sustainable energy, varying little from day to day (as opposed to wind and solar energy, which are reliant on unpredictable weather patterns). To generate hydroelectricity, you will need a running flow of water with an aspect that falls from a height (like a waterfall). It is the 'fall' of water that generates the energy; even a relatively slow running a stream can generate electricity if it has a water 'fall' or 'head'. You will need your water supply to be relatively close to your house, and you will need to ensure that there is enough energy being generated by the fall of water. Advice on calculating the flow of energy potentially produced by your water source can be found on the BHA website. If calculations are successful, and you find that you have a potential energy source, you will then need to investigate planning permission. Hydro systems create some noise, which may meet with resistance from neighbours, and can be visually imposing. Of the three main systems of generating electricity at home, hydroelectric power is the relatively expensive to install at £4,000 per kW, with costs varying greatly depending on the size of the project. This comes in at around the same price as solar energy for a small domestic setup; however, incorporating hydroelectricity may well involve large scale landscaping alterations to surrounding land, increasing costs. Despite this, the initial outlay will be made back at a greater speed, proportionately, than if you install wind or solar energy, and the supply will be reliable, constantly, for up to 50 years. If you have the resources to produce hydroelectric energy, it is a financially viable source of secure, reliable energy. What a great resource thank you for all the information this is something I have been planning for some time now.Thanks for the motivation.